It's tonight. And at the last minute, even though I have something else this weekend, Anita, danah and Kaliya convinced me to go. So.. I'm going. Can't wait. Been working on a tagging solution today involving Identity, Creative Common's licensing, and Tags for two different types of tagging in personal publishing (blogging). Drummond Reed and I have been working on this periodically for about 6 months, and finally figured out the security and privacy aspects at our meetings this past week, though we'd figured out the syntax and usefulness of it last April and June. Kaliya Hamlin has also been helping a bit. Looking forward to talking with folks about it to see if it makes sense. It's called iTags because it includes identity in the tags. The idea is that a user could tag an object (photo, video, sound file, text or an entire blog post), where the tag, and the object, would then go out through the RSS feed or be spidered, with some additional information that doesn't now exist in tags. That tag and object would include the user's identity, the licensing for that object (presumably people would use this more for rich media objects than for just a blog post, as most blogs already have licensing generally for text on the blog) if needed, and the tag. It would remove the requirement for a tag to be coupled with the originating URL (blog post URL) because identity would be inside it. It would allow individual CC licensing which rich media producers want to do sometimes, in order to differentiate the rich media object from the rest of their blog, which may have different licensing. 2. create tags that are not visible but still trusted (like categories which are not visible but still included in systems like Technorati's tag system, where of the 100% of tags, 95% are actually category entries and only 5% are actual tags). It still allows users to create tags that do have explicit links if the user wants them, as is already being done. It's backwards compatible with Technorati, but allows additional functionality to meet these other goals. Wiki for this stuff is here. Please feel free to add to the wiki or comment here about this. Would love to know what you think. Update: I changed the name of the post to reflect the actual title of the event and Stowe's comments below. How will we keep up with the "dark, expanding ocean of data we spew"? Algorithms? Social filters? Faster memex-like gadgets? Do we need open algorithms in future search, so that each person can tweak their own preferences? Will we become dependent on social networks to filter the world for us, and if so, are the current representations of social relations too coarse? Will we be spending more and more time creating explicit metadata, like tags, in order to help channel the "expanding ocean"? What does it mean to be smart, today? Kevin and I are planning to work from an brief framing of the issues with a short outline for a led discussion. If you have any ideas, please comment below. Would love to hear your ideas. Also, if you are interested in attending, there is a registration form here. Today I got a call from a friend wishing me a happy birthday (was yesterday). He exclaimed: you were offline for 24 hours! Yes, it's true. I took a day off. Another friend flew me to Sierraville hotsprings (from Palo Alto) for a soak in the pools. Then we came back to the bay area for dinner. The amazing part is it's only one hour, twenty minutes to fly, but 4.5 hours to drive. And way more fun to fly too. Very beautiful. And a very nice present! When I got back, some other friends left me voicemail: we would sing you happy birthday, but we would be in violation of copyright as Cingular will record it and plays it back to you later. So, we are just going to wish you happy birthday. Lovely. Wouldn't want to violate copyright! And I just found out David Johnson's birthday was yesterday too. So happy birthday David! Meeting Ward Cunningham. Creator of the wiki. He's really awesome. And meeting Chris Locke, whose blog is caustic, but I still enjoy it. And yet in person, lovely man. And sitting next to Bob Metcalfe last night at dinner for a couple of hours. Telling me stories about his place in Maine and the social structure from a local's point of view, his food-historian triathlon running wife, comparing notes on places we've traveled (Barcelona is really high on both lists), and on how much we both enjoy making things, how time can stop when you are making something that engages you. And how he can't communicate with his kids without IM. Charming. And very sweet. My least favorite part? Well, there are only 6 women speakers out of 106, and there are very few women here at all. In fact, I have to say, there are very few women entrepreneurs, and we must do something about this. Women are naturally very good at the things this kind of work requires, and yet, we don't do take it up very much. Why? Obviously, much more than a speakr wiki is required and yet the wiki points to many of the problems here: women are afraid to sign up because they see other more accomplished people and find that intimidating, instead of realizing everyone starts without much and builds up (whatever: talks, experience, education.. it's a process and there is nothing wrong with having less.. in fact, I think there is a huge opportunity there to show something new!) But we really have to do better and conferences like Web 2.0 really point to the problems in this area. Because we build things for the whole human race, as software developers, and yet if we don't engage women, we are losing experience, perspective and opportunity to balance our products and make better experience. Yes, I get the irony that I've mentioned only men above. But there really are very few women at this conference. And I've met them all before. Those above are the new people I've met that were fun for me. As I said, we must do better. And I'm no exception. I did a workshop on video, and invited three men. But I don't know any women in video who are entrepreneurs. So I checked the wiki, and couldn't find any others. So we had three guys. Hitting my own wall in the speaker wiki isn't fun, but it's helping me see some of the issues from a conference organizer's point of view. There is a lot of work to do there: getting people to sign up, working on categories, working on search, working on getting more women into areas they want to be in, to be successful and visible if they want to be. Data for the rest of us? In acquiring Weblogs Inc., AOL has now provided us with some numbers traditional media are willing to pay for a blog. Looking at the numbers above, one can try to guess at the value of a link from an external site. a single link on the weblogsinc network represents 0.002258559942180087 percent of the overall network. I don't know if those values are based on any real rationale but it's nice to dream up the value of one's blog based on this. Should we now assume that traditional media companies are willing to pay between $500 and $1000 per site that links into a blog? Not quite. The incremental value is in the size of the network and the underlying tools. Jason and Brian have been working on developing a blog authoring technology, called BlogSmith, that sits at the core of their network and one has to believe that AOL saw some value in the software too. However, one can easily say that blog valuations are going to be easier to make after this deal since it provides the first yardstick in that space. Read the rest.. it's quite clever. You can't characterize the size of the network based on in-bound link counts, in part because there are at least 25 other digital social gestures that matter, 10 or so that we can currently count, and yet hardly any of the services are counting them and in part because just counting links doesn't mean very much. There are many other factors in terms of quality of each gesture. But still, I think Tristan has made a very funny post and you should check it out! A for effort and humor! 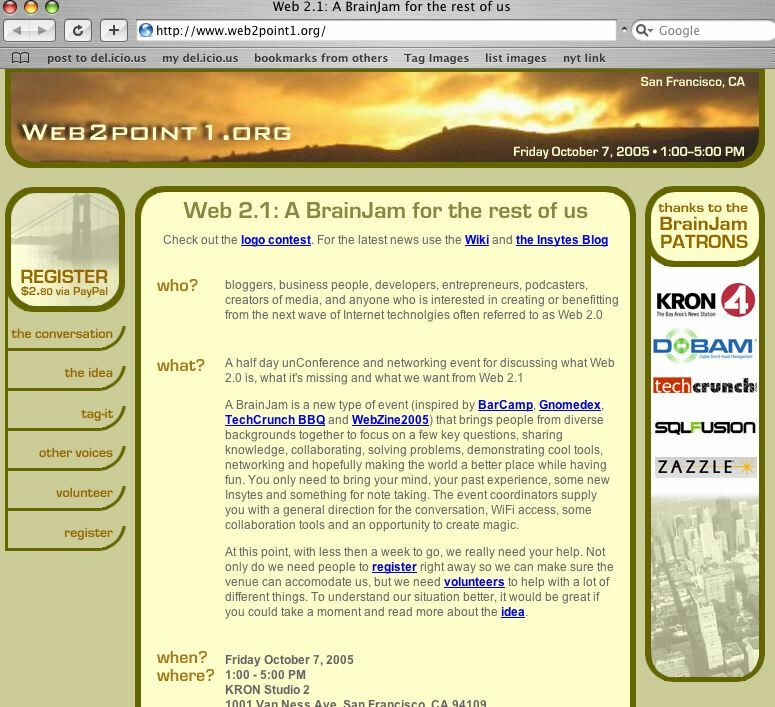 I'm moderating a session today with Brad Horowicz, Josh Felser and Dmitry Shapiro at Web 2.0 at 11:15am. This place is packed. I'm not sure how we are going to have a discussion.. but we will be having a led discussion with the audience!